Last night ANC 6C voted unanimously (6 – 0) to oppose MGM’s Historic Preservation Application (HPA) for modifications to a building on Stanton Park that the company wants to be the home of their 10 person Washington, DC lobby headquarters, at 501 C Street, NE. The vote could delay the project and require MGM to go back to the drawing board if the Historic Preservation Review Board gives the required “great weight” to the ANC opinion. On Monday, MGM submitted revised plans to the Historic Preservation Office, with a number of modifications to the design they brought before the Planning and Zoning Committee, in an attempt to address some of the committee’s concerns. Mark Eckenwiler, chair of the Planning and Zoning Committee told the commission last night that while the committee was generally supportive of the renovations proposed for the building itself, there were still areas of concern. He acknowledged that the revised plans resolved concerns regarding the use of public space for parking. However, he noted, the committee’s main concerns regarding the additions at the rear of the building had not been modified at all. These included the exterior elevator shaft extending beyond the eaves, the trellis running the length of the large roof top deck on top of the one-story historic structures added to the building, as well as the deck itself. He also cited failure to conserve the façade of the historic structures behind the building and the proposed use of stucco on the exterior of the rear additions. Though not directly related to historic preservation, Eckenwiler said that concerns of the nearby neighbors regarding the noise from rooftop deck gatherings (fundraisers) had not been addressed. An MGM senior vice president for government affairs responded, asserting that the building will be used for office space for fewer than 10 people, Monday through Friday, 9 AM to 6 PM. Regarding the noise concerns of Capitol Hill neighbors she said that and MGM intends to be a good neighbor, is very sensitive to noise issues, and that residents could call upon her personally to address any issues. She said MGM would use the deck for “small functions” and would “work with neighbors.” She said that the company’s operations would result in no parking or traffic disruptions – employees who do not live in the neighborhood, will use public transportation or rental parking. Attendees at fundraisers will use Uber or Lyft. Anne Adams, representing MGM on matters regarding historical architecture, said that it was not possible to put the elevator shaft inside the building because it would disrupt the historical interiors which MGM is trying to preserve. She noted that the elevator made the building ADA accessible and that it will be partly hidden by the trellis running the length of the rooftop deck. Commissioner Scott Price guessed that the deck could be as large as 900 square feet and could accommodate a much larger gathering. He worried that if MGM sold the building, the community would be stuck with the potentially bad behavior of a future owner, with no community ability to hold the owner accountable. He cited similar problems which had arisen regarding decks used by the Heritage Foundation and a nearby Georgia State University student housing facility. After the meeting, Price took the initial steps to create a dialogue between the nearby neighbors and MGM, with the hope of reaching a community agreement regarding MGM operations should a roof deck ever be sanctioned by the city. 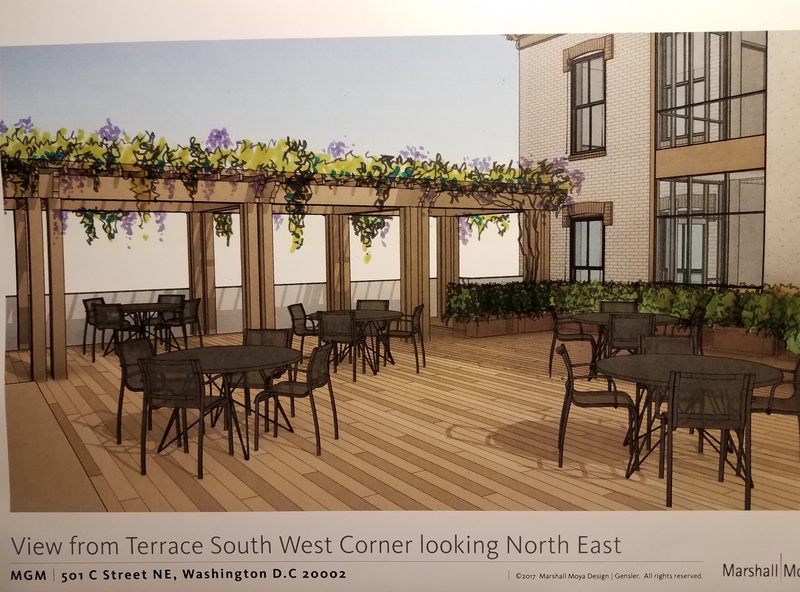 However, given the unanimous opposition of ANC6C as well as that of the Board of the Capitol Hill Restoration Society, it seems unlikely that the project can go forward under the latest proposed plan. The hearing before the Historic Preservation Board which will decide the matter will take place Thursday, June 22. A correction: The party deck is roughly 40 feet by 40 feet, or 1600 square feet. Such a space could easily accommodate 120 people. At least, that is the crowd size suggested for similar sized rooms available for parties at the MGM Casino at National Harbor. According to this online calculator, such a space could accommodate 266 folks for a standing cocktail party. (https://www.banquettablespro.com/space-and-capacity-calculator). They didn’t understand that the way to get support from ANC-6C for a new roof deck is to be an ANC commissioner like Tony Goodman was when he got unanimous approval for his. Given the their record on approvals for variances requested by the Heritage Foundation, it would be a good idea to offer the commission free meeting space too. I don’t recall getting a ballot from DCBOEE for the Capitol Hill Restoration Society election. Why should there view carry greater weight than any other private organization, even MGM itself (the real property owner)? I live diagonally across from the proposed 1,600 square foot deck on the one story annex facing 5th Street. While the MGM representatives say the deck will only use be used for receptions/fundraisers of 15-30 people, the deck would be large enough to hold more than 100 people. There are no assurances about the hours in which events would be allowed, limitations on the number of people who could attend, or the frequency that events would occur. Even if such assurances were provided in writing, enforcement of them would be difficult — if not impossible. None of the neighbors on the block were informed about the proposal before the article that appeared in Capitol Hill Corner (thank you), so have had very limited opportunity thus far to weigh in about our concerns about the deck and the party noise that would interfere with the normal enjoyment of our homes, which have living rooms and main bedrooms facing the deck. Needless to say, we are scrambling to make these concerns known and hope they will be addressed in the final project plan — such as by reducing the size of the deck, moving the deck area farther back from the street, and incorporating effective noise abatement measures. Sadly, the Historic Preservation Board staff recommendation approving the “concept” of the project includes no discussion of the potential impact of the party deck on the 5th Street neighbors, which suggests they did not take this issue into consideration at all. Note also that there is no mention of Peabody School which is located directly across from the proposed deck; any daytime events on the deck could also interfere with school activities. A meeting of the Historic Preservation Board will take place on June 22, with discussion of this project scheduled for 1 pm. Great post – thank you Donna! My concerns are the same even though my home is at 5th and Constitution, a 1/2 block away. I’ll be at the next meeting! There is PLENTY of office space in the new buildings at Eastern Market on the old Hine School property. Yes they would be a couple of extra blocks away from the Congress, but exercise might be good for them if they walked!